This blog entry about the events of Thursday, June 23, 2011 was originally posted on June 28, 2011. “IS THIS YELLOWSTONE?” Cheryl asked me, waking up in the passenger seat of her two-door Honda Civic. She’d often sleep in the car when she wasn’t driving, with regular naps usually between 11:30 and 12:30. “Not yet,” I answered. “I think it’s just Wyoming.” Around us was the prettiest American land, and we hadn’t even arrived at Yellowstone National Park yet. I had driven us westbound from Gilette, WY, through the “fruited plain” and up the “purple mountain’s majesty” of the Big Horn mountain range (not actually purple) — a true test of my stick shift driving skills. Going up the switchbacks, through the snowy peaks, and back down the other side proved to be not much of a challenge, even in a passing thunderstorm; I even coasted in neutral for most of the way down. We made a pitstop in Cody for lunch (with an elk burger), an oil change, some window shopping, and a camping supply run; it was the last big town before arriving at the eastern entrance of Yellowstone National Park (YNP). A tunnel took us through a mountain and eventually to Yellowstone Lake in the southeast quadrant of YNP, where things started to get a little more interesting, not just because amidst the tranquil scenery we were blasting Dr. Dre, but because we started to encounter wildlife. From a distance, we saw the bodies of bison; we were in the home where the buffalo roam, after all. There were other people parked on the side of the road to admire the beasts, most notably this big Asian-American family where all the kids wanted to get closer to the buffalo despite all the warnings in the park not to get too close. Their parent/guardian simply told them to look out and not to step in poop. On the way to the Canyon Campground about forty miles away (Yellowstone is pretty big), we encountered more and more bison on the way, so many that the novelty wore off and they became as commonplace as squirrels in New York City. We tried to make the buffalo more exciting by playing Neneh Cherry’s “Buffalo Stance” (until we got spotty internet service), and by pronouncing “bison” the way Cheryl’s boyfriend Andy does, with a French accent: bee-sOHN’. During the three days we spent in YNP, we stopped less and less for bison; the only times we were really concerned with them was whenever they threatened to charge us (or motorcyclists, picture above) on the road, or cause traffic jams when a herd of them crossed the road to get to a water source. “Bison rubbernecking,” Cheryl said. The more interesting animals were the ones we didn’t see all the time: a prairie dog near Tower Falls; a chipmunk in the parking lot of Yellowstone’s Grand Canyon; a couple of mule deer bucks on the Yellowstone River; and two eagles, one flying down the Yellowstone River, and one perched on a tree branch on Stevenson Island in the middle of Yellowstone Lake (when we took a boat tour). There was also fish everywhere I assume, evident by the fishermen in boats, on the river banks, and in the river with fly-fishing pants on. Yellowstone National Park is definitely Bear Country, as reported by the warning signs all over the park alerting tourists — particularly vulnerable hikers and campers — of their presence. When we checked into the Canyon Campground our first night (pronounced cahn-yOHN for fun), the manager made sure we understood the rules of the land. “[We got a lot of snow this winter, and the snow’s melting and all these carcasses of elk and deer are coming up, and the bears go after them,]” she told us. “[So the bears are pretty active now. ]” She continued by giving us precautions on how not to attract a bear in camp. Bears have a keen sense of smell and will go to anything that smells like food, so we shouldn’t wash dishes outside (there’s a designated indoor spot for that, near the bathrooms), we shouldn’t drain food on the ground, and we should make sure everything that could smell like food is locked up in our car. We set up camp in spot F-130, half a mile up a hill from the registration office, laundromat, showers, and recycling bins. “Wow, we’re completely exposed to the wilderness,” I pointed out as we set up camp. “Maybe there’s an opening at the lodge.” But Cheryl knew our destiny was in the woods. What we didn’t expect was it to be so friggin’ cold; at 7,900 ft. above sea level, it was barely a summer day in the mountains. In fact, there was still snow in our campsite, which only proved to be worthwhile when we realized we could use it to refrigerate our beer. That makeshift ice box was our only natural amenity in camp; across the way from our car was the toilet/dishwashing shelter, but other than that we were in the real deal of the wild: no electricity, no lights, not even a decent wireless data connection — a real damper on our race to post pictures to Facebook. We made dinner with my campstove — penne with chicken, parmesen, olives, garlic and spinach — and then built a fire for warmth, using wood and kindling we bought from the office. There was a ranger talk that evening down the road, but we opted to just stay in. “Let’s just get drunk and look for bears,” I suggested. Our fire grew brighter as the sky got darker. I toasted marshmellows (burnt them really), while the two of us toasted some Dakota red wine in our Nalgene bottles by the flames. We were the only ones in camp around us awake beyond the 10 p.m. quiet time. “What if I went to the bathroom in the middle of the night, and there was a bear,” I theorized to my fellow camper. However, the only threat during our nights in camp was the cold; Cheryl made sure she had five layers on, bundled in her sleeping bag like a mummy. “Guess we didn’t see a bear,” I said our first morning in camp, as we made breakfast (oatmeal and coffee) with the campstove, followed by a pasta lunch to pack on the road. It was less than an hour when we started our safari on our first morning in YNP. Buffalo may have gotten old, but the beautiful landscape hadn’t yet. “Wow… I already want to come back and we haven’t seen anything yet,” Cheryl said — but she spoke too soon. “What’s everyone looking at?” we asked a woman on the side of the road, leaving her car in an undesignated area amidst half a dozen other cars. “There’s a bear up there,” she answered. “A bear!” I shouted, pulling over and parking on the side. “I don’t think this is a good idea,” Cheryl warned me — but I was already jumping out of the car with my camera. I walked up the hill across the street to see the meandering black animal about 300 ft. in front of me: a black bear. It was kind of hard to see, even at that distance, but it was made clearer with my camera’s zoom lens, particularly when the bear looked up from the grass for a split second. A handful of us onlookers heeded caution while snapping away, until the bear went the other way. The elusive moose was the only prized trophy we never encountered — “We better see a moose, man,” I kept saying — but the only thing we found was a stuffed one in a gift shop. “I still want to see a bear,” I said during morning tent talk our first morning. “Like Yogi,” Cheryl said, which got me thinking. I love camping!!! I am so jealous of this trip. Up here we call stalled traffic for bear viewing “bear jams”. 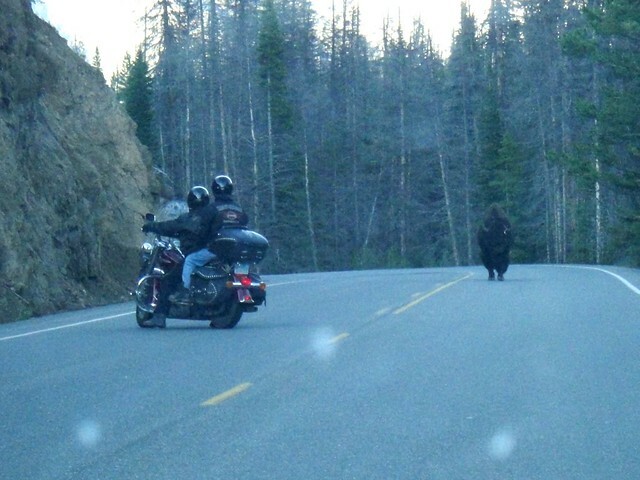 There is a patrol in Banff National Park to break them up and move the gawkers on.